A new technology to reverse age-related loss of near-vision! Beyond the age of 40 the eye´s crystalline lens is becoming more and more unable to change its shape required for focusing to near objects. Reading glasses are needed to compensate for that deficit. The internationally patented multi-focal.vision technology is designed to reverse the loss of near-vision by a short and safe minimally invasive procedure. A tiny inlay of only 0.3 mm in size is inserted into the cornea just beneath its surface. This inlay reshapes the cornea into a multi-focal cornea in order to allow multi-focal optics and focusing again on both, near and far objects. It is similar to the mechanism how progressive glasses work, however, without the need of glasses! Moreover the cornea itself changes into a progressive (multi-focal) state. The picture shows how the inlay displaces corneal tissue to create a multi-focal cornea (click to enlarge). 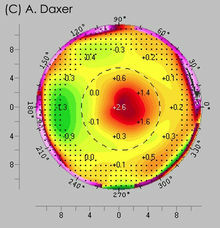 One can see the corneal light reflex in the center which hides the tiny inlay, the near-vision zone surrounding the center and the distance-vision zone surrounding the near-vision zone. The pupil terminates the distance-vision zone. Quick and easy - safe and reversible! The video on the right shows the surgical procedure in a living human eyes. The multi-focal.vision treatment is quick and easy to perform with very promising results. It takes only a few minutes to prepare the cornea and to insert the inlay. The preparation of the tissue can either be performed by means of a Femtosecond Laser or by means of the DIOPTEX PocketMaker Ultrakeratome. The treatment is free of pain during and after the procedure. The inlay is designed to be worn permanently but is, however, reversible and can therefore be removed easily at any time. After removal the eye is as before the treatment. A pilot study in amblyopic (low vision) human eyes demonstrated that the multi-focal.vision concept is both, reasonable and feasible. The minimally invasive procedure was safe as well as quick and easy to perform. No pain was reported by the patients, neither intra- nor postoperatively. The effectiveness was demonstrated by corneal topography and biomicroscopy. The tiny wound at the cornea is self-sealing and requires no suture. Healing of the wound lasts only a few hours. The rehabilitation time was less than 1 day. The picture on the right shows the topographic difference between the preoperative and the postoperative cornea, respectively. It demonstrates clearly the 2.5 diopter addition after treatment (red area) required for near vision (click to enlarge). 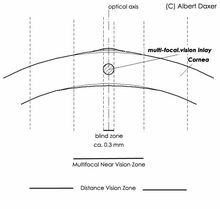 A multi-focal addition for near-vision of about 2.5 diopters is surrounded by an unchanged cornea for simultaneous distance-vision. 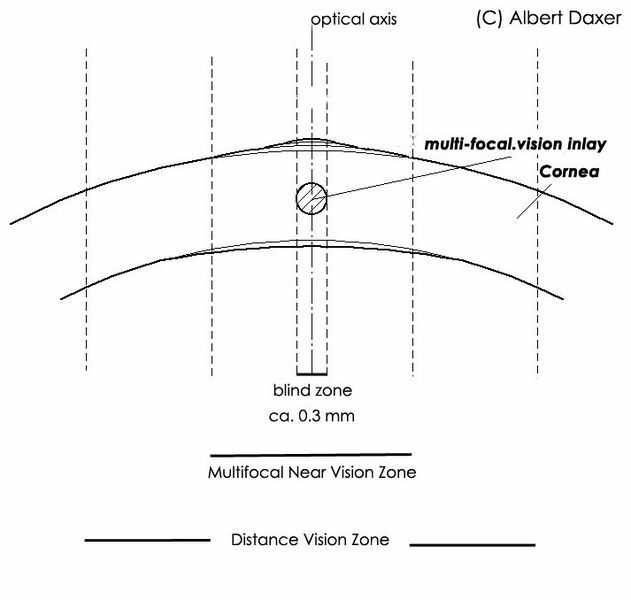 The distance-vision zone is terminated by the pupil size (interrupted circular line). 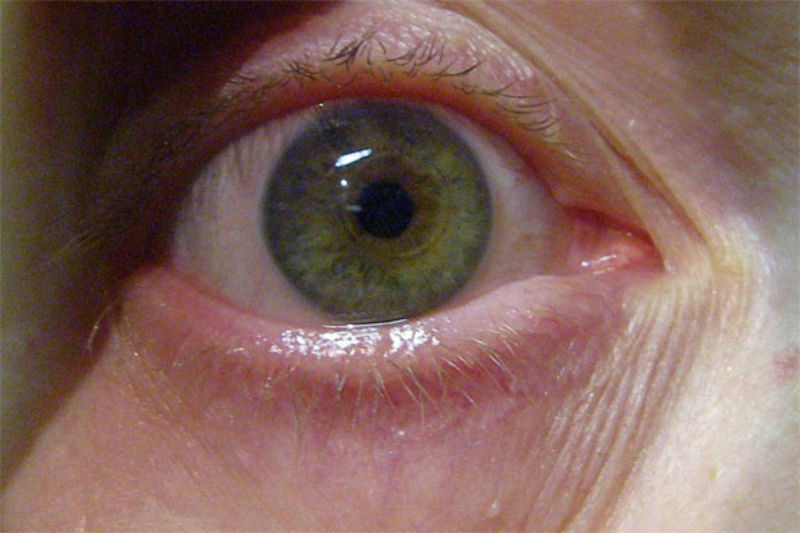 The surgical technique to be used for multi-focal.vision treatment is proven as safe and effective without relevant complications in more than 10.000 MyoRing keratoplasty treatments (CISIS) for keratoconus during the past 10 years. MyoRing keratoplasty is currently the most effective therapy for keratoconus at all. The only difference between multi-focal.vision treatment and MyoRing keratoplasty is the shape of the inlay inserted into the cornea. Instead of the tiny multi-focal.vision inlay, MyoRing keratoplasty uses the MyoRing corneal inlay. To learn more about MyoRing karatoplasty as the basic technology for multi-focal.vision please visit www.keratoconus-international.com. The optical principle behind the multi-focal.vision inlay is proven as effective already in thousands of cases where multi-focal intra-ocular lenses (IOL´s) have been implanted into the eye after crystalline lens removal during cataract surgery or for refractive lens exchange. The difference between multi-focal IOL´s and the multi-focal.vision inlay is that multi-focal.vision inlay treatment is minimally invasive without the need to open the eye and without removing parts of the eye (e.g. 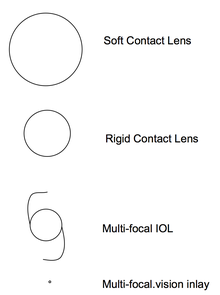 crystalline lens). The Multi-focal.vision inlay is therefore easily reversible while multi-focal IOL removal is not so easy and much more risky. Also the surgery itself is much easier and safer compared to multi-focal IOL´s. This is of particular importance for those patients who may sometimes not be happy with the results. However, the patient selection criteria are the same for both treatments. The multi-focal.vision inlay is therefore the ideal choice for patients who have already age-related loss of near vision but no cataract. 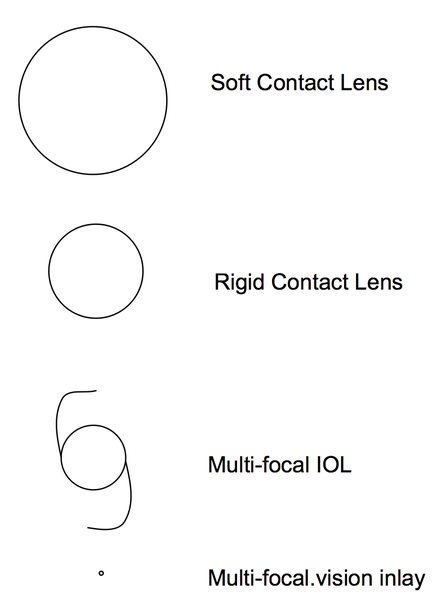 While multi-focal IOL´s are the carrier of the multifocal effect, the multi-focal.vision corneal inlay has no intrinsic multi-focal property and even no intrinsic optical function. Moreover the multi-focal.vision inlay induces a shape change in the cornea by shifting volume into the area around the inlay and which results in a multi-focal cornea. 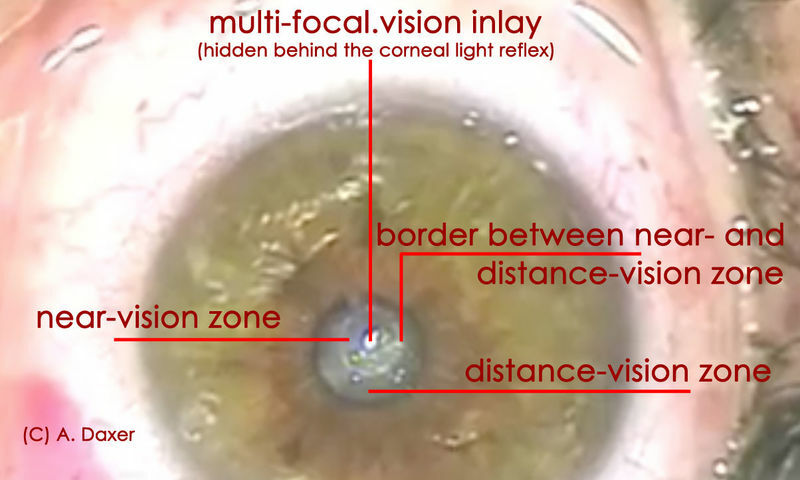 The multi-focal.vision inlay is, by the way, the worlds smallest implant! What are the advantages over competing technologies? Competing technologies include reading glasses, progressive glasses, multi-focal contact lenses, multi-focal IOL´s and 3 the other types of corneal presbyopia inlays. Multi-focal.vision is designed for those patients who want to be rid of glasses. Multi-focal contact lenses are often not well tolerated. Multi-focal IOL´s are effective, but not minimally invasive and hardly reversible if a patient should not be happy with the result. In contrast to the other 3 types of corneal presbyopia inlays the multi-focal.vision inlay has neither an optical interface between the inlay and the corneal tissue nor does it surround a small optical zone. Moreover the optical effect of the multi-focal.vision inlay is indirect by shifting corneal volume away from the inlay to create a multi-focal cornea in the surrounding. Therefore the risk of irreversible visual loss over time by means of tissue reaction at or close to the inlay-tissue interface in the optical center is eliminated by this new technology. Since the multi-focal.vision inlay is so tiny it does not block the vision, even if the material of the inlay is non-transparent. At what stage is the Multi-focal.vision project? The technology is protected by international patents and already developed to the state of clinical application. The results of a topographic pilot study are excellent and show that the technology has the potential to solve the problem of age-related loss of near-vision once and for all. The next steps include securing a financial backup for multi-center clinical trials, completing international approval as a medical device and global marketing of the new technology. What is the potential number of treatments? In 2017 almost 7.5 billion people were living on earth. At least in the developed countries the population is significantly aging. Except in third world countries more than 25% of the population is older than 40 years of age. Therefore at least 1 billion people (2 billion eyes) who can potentially afford multi-focal.vision treatment suffer from age-related farsightedness (presbyopia) and are looking for a useful solution. We wish to establish a new company as a spin-off of DIOPTEX GmbH for global marketing of the multi-focal.vision corneal inlay. DIOPTEX was founded in 2003 by Dr. Albert Daxer in Linz / Austria as a research and development company focusing on sophisticated solutions in ophthalmic surgery. DIOPTEX is an ISO 13485 certified medical technology company has the background, capability and knowledge to master research, development, production, regulatory affairs, intellectual properties, production at industrial scale and global marketing. To learn more about DIOPTEX please visit https://www.dioptex.com. To learn more about the founder Dr. Albert Daxer please visit https://www.keratoconus-international.com/dr-albert-daxer/.